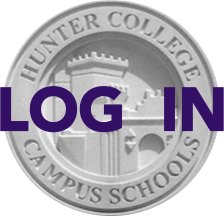 For the fourth year running, Hunter College High School presented a Science Research Symposium ​highlighting some of the ongoing research that Hunter students are engaged in. Students who have been conducting research talked about their work at the event, which was held on Thursday, May 22. The keynote address, "Why is drug discovery so difficult?" was given by Dr. Hazel Szeto, a professor of Pharmacology at Weill Cornell Medical College. 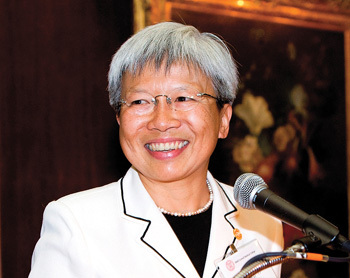 Above, Dr. Hazel Szeto of Weill Cornell Medical College. For more on the students and their research findings, read on. --Azraa Chaudhury, HCHS '14, will talk about research conducted at Rockefeller University on "affinity purification of intact nuclear pore complexes for structural characterization of the nuclear basket." --Axel Feldmann, HCHS '15, will talk about his research at Mt. Sinai School of Medicine on "Search Engine to Map FDA approved drugs to diseases based on microarray data mined from GEO." --Margarita Ren, HCHS '14, will present her research done at Weill Cornell Medical College on Alzheimer's. For more information, contact the research coordinator, Gilana Reiss, at greiss@hccs.hunter.cuny.edu.